There is a drink called the "Muppet", but you might know it by its other name: the Tequila Slammer. Simply mix tequila and 7-up and you've got yourself an easy cocktail to use for this game! You bet we are, tequila. 1. Drink for Title Drops: That's the full title, "The Muppet Show"
4. Drink for musical numbers. 5. Drink when someone says the guest star's full name. 1. Title drops: Drink whenever someone says the word "Muppet"
2. Drink for punching. Or any kind of physical violence, really. 3. Drink for explosions. 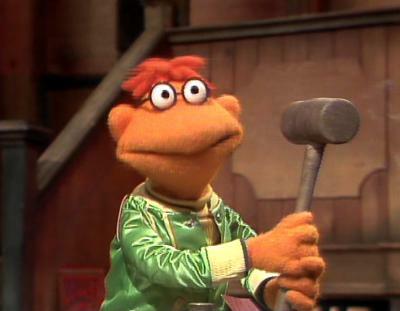 Need I remind you, there is a muppet whose life is devoted to causing explosions? 4. Pick a muppet. Drink whenever he or she appears in a scene. Once per scene, please. 1. Title drops: Drink whenever someone says the word "show"
3. Drink when a sketch repeats throughout multiple episodes. 4. Drink when the camera cuts to the audience. 5. Drink when things go wrong. All that means is, whenever things don't go according to Kermit's plan. Right away, this was another one of those shows that people had a hard time focusing on. We watched five episodes, about two hours of TV, and during that time people got up to go outside, a pizza was ordered, and we had many in-depth discussions about Gonzo's nose and the endless possibilities it offered. This all comes from "The Muppet Show" being geared towards children; it's got enough going on that you can kind of tune out whenever you feel like it, but not so much that you feel like you're missing anything when you do. This also made our drinking game near perfect, but we missed calling out a lot of the rules. As Some Guy pointed out, watching multiple episodes of "The Muppet Show" in a row is overwhelming. You need to chill out a bit before jumping back into the fray. Acknowledging that this is a complex show with hundreds of moving parts, with dozens of characters that all have their distinct personalities and features, with live and pre-recorded performance aspects intermingling, I feel like "The Muppet Show" achieved the impossible. It both satirizes and celebrates Vaudeville while giving us lovable characters who TO THIS DAY, forty years later, we as a culture treat like human celebrities. We love them. Like people. How impressive is that? Like, the new movies are great and all, but the strength of the Muppets lies in their collaboration and watching how they entertained people. It was watching them in a ramshackle theatre putting on a show. And the fact that these episodes are online in some form for people to watch is historically important. One of the guest stars we saw during our game was Sandy Duncan. None of us had heard of her. I knew from her Wikipedia article that she was a broadway dancer who played Peter Pan at one point, but none of us knew what to expect from her, so we were less excited by her than by the prospect of watching Steve Martin or Carol Channing (which we did later). Then her show-stopping number happened and she blew us all away. ARE YOU SEEING THIS? This woman is a fireball. She's a veritable triple-threat, she's executing pitch-perfect dance moves in high heels, knocking back whiskey shots (every one of those got us another sip) and belting out this song that I now want on my iPod. And I'd never even HEARD of her before watching "The Muppet Show". I don't think we have a show like this now, one that celebrates theater artists and makes sure the general public knows who they are. One that makes theater accessible for children, and gives them a good idea of what putting on a show is actually like. In a good episode, you can see someone like Pavarotti do his thing, and then five seconds later watch Kermit and Scooter freak out about some backstage accident (drink). That's amazing. I really miss Jim Henson all of the sudden. Every performance group needs a stage manager as good at their job as Scooter. Also, God, this show is weird. I hear you on the other end being all, "Duh, it's about puppets", and I'm saying that even for a really elaborate puppet show, this show is WEIRD. Have you ever gotten a good look at these muppets? What about this one? Is he...is he a pimp? That's Dr. Teeth. 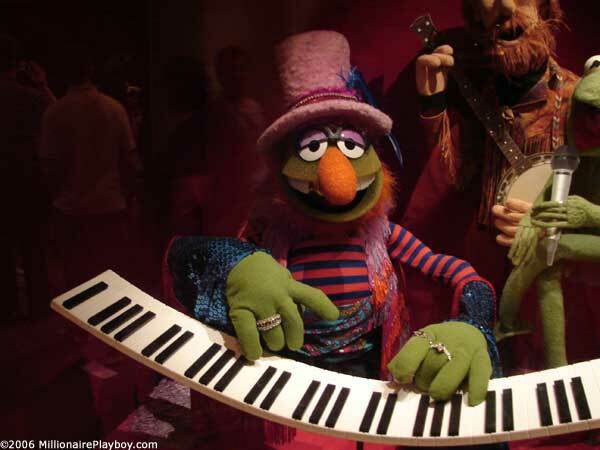 He's the lead singer of the Muppet Show Band, endearingly called "Electric Mayhem". He is based off of session musician Dr John. Or have you ever really thought about the Swedish Chef? It's a character that speaks in pigin Norwegian and teaches you to cook. Using ingredients that are often alive and sentient. 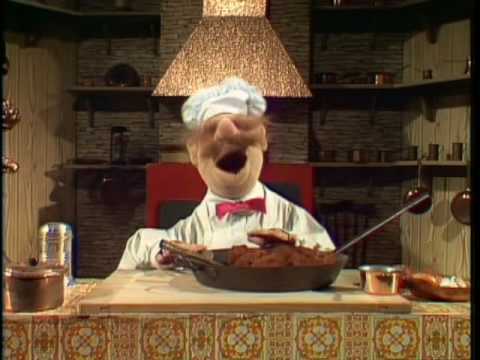 The reason the Swedish Chef is so great is that HE knows exactly what he's doing. There's an extra layer of surrealism that goes along with watching this show NOW, because my generation has their own idea of what muppets are like. In essence they're the same, but the style of humor has changed ever so slightly, trending towards snark and irony more than slapstick and baldfaced sincerity. Today's muppets are both cult icons and pop culture icons, in that way, because we've got the muppets of the past and present being referenced side by side on the internet and IRL. See, MY generation is the one that made things like the Muppet Alignment Chart. For an example of what I mean, take Statler and Waldorf, the old guys who mock the show from the balcony. They're obviously critics, but very specifically they're well-off, cultured, and male. And there's two of them. There's another pair I can think of like that. Although Gene Siskel and Roger Ebert had been operating as film critics for years before the Muppet Show, the two didn't team up to review as a pair until the mid-70's...around the same time the Muppet Show was airing. Their career together boomed around the early 80's, once the Muppet Show was off the air. Now, we know that Statler and Waldorf aren't caricatures of Siskel and Ebert because Siskel and Ebert have their own muppets based on them. So Statler and Waldorf, who were (barely) first enhanced the image of the critic, which Siskel and Ebert than fed off, which in turn strengthened the satirical elements of later incarnations of Statler and Waldorf. And so the circle of media will continue, with The Muppets at the heart of it. 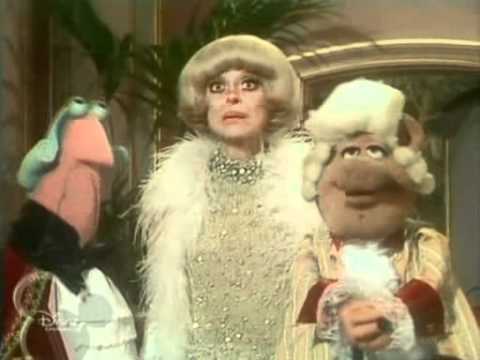 Soon the world will be populated by Living Muppets, like Carol Channing. One cool thing about the Muppets, which seems like a simple thing but is hard to get right ensemble shows, is the level of depth their interpersonal relationships had and how clear those relationships were made in a twenty-minute span. 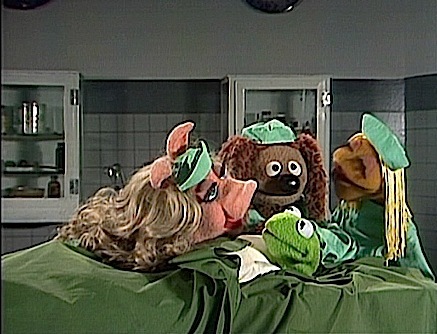 It's one of the reasons it's a little weird to see what Miss Piggy looked like in the early seasons. I'm pretty sure that nobody really knew what to do with Miss Piggy, because there's nothing differentiating her from any of the other chorus girls (who are also pigs) on the show. Eventually, though, her personality and her meteoric rise to stardom were set. Miss Piggy is a Femme Fetale (in the sense that she'll punch you if you look at her the wrong way) with her eyes on stardom, and she's only got two people's interests at heart: herself, and Kermit the Frog. Kermit and Piggy are famous for their romance, but it's played up a lot more in the movies. They play opposite each other in films like "Muppet Christmas Carol" and "Muppet Treasure Island", and in those cases their devotion to each other is plain to see. In the show, however, it's a little hot and cold. Miss Piggy being the hot, Kermit being cold-blooded. Bride of Buggerlas puts it very well. "Kermit believes that he's a professional," she says, "so he can't show preferences to any of his performers. Miss Piggy, meanwhile, is the motherfucking star, so she doesn't see why she shouldn't get special treatment." Kermit's got a constant struggle whenever Miss Piggy is on screen. He wants to keep her happy and make her feel cared for, but he also wants to make sure she's doing her job and not getting offended if he's suddenly called away. Miss Piggy has little patience for the technical side of the business, but it's clear that she's a devoted performer and she's actually less of a diva than I remember. That aspect of her personality must have been added in later; even though she has a slight jealous streak and truly wants attention, she works well with most other members of the cast and will more often than not do what's best for the show instead of being completely self-serving. I have to admit that I questioned Kermit and Piggy's chemistry for a minute, but everyone else (especially Bride of Buggerlas and Champjagne Austgin) helped me see that just because they're not all over each other doesn't mean they're not in love. Their relationship is surprisingly mature. They're partners, one the king of the backstage and the other the queen of the show. As one of television's first power couples, they certainly deserve to be remembered for their love. I mean, she did kind of trick him into going to their wedding, but let's forget about that part. It's difficult to watch a lot of this show in one sitting, but don't fret. The game is difficult enough that by the second or third round you should be feeling the effects. Here are some extra rules if you find yourself flailing. We couldn't keep our eyes off some of these dresses. Linda Lavin was wearing one that had a...a scarf or something wrapped around it? Maybe it was a belt? It was purple, I can tell you that much. Drink when someone compliments the guest star. They're super polite at The Muppet Show. Drink when a sketch references a pop culture phenomenon or other familiar piece of art. My personal favorite being "PIGS IN SPAAAAAACE"
As you may have gathered, my friends and I love a good song-and-dance number. Next time we'll be looking at one of the most famous movie musicals of all time. For Your Inebriation is written by Krissy Pappau (Hollis Beck). All "Muppet Show" images and videos are owned by Disney.